5 Bedroom Terraced House For Sale in Bath for Offers in excess of £1,000,000. The ground floor entrance hall opens to a front facing dining room with moulded cornicing, shutters and a fireplace illustrating the architectural design of Thomas Pinch. To the rear is a kitchen breakfast room with a small utility and rear lean to leading out to the garden. Ascending to the first floor is a bathroom and separate WC on the half landing, the front facing drawing room has the same architectural features as the dining room and wedding doors lead to a withdrawing room, more recently used as a bedroom with wash basin. The second floor comprises two bedrooms each with fireplaces and the top floor completes the main house accommodation with two further rooms in the eaves providing elevated views across the city towards Bath Abbey. A further attribute is the self-contained basement apartment accessed from the front courtyard and the rear garden. Offering two rooms with a bathroom and former stairs leading to the main house. There are two connecting vaults. 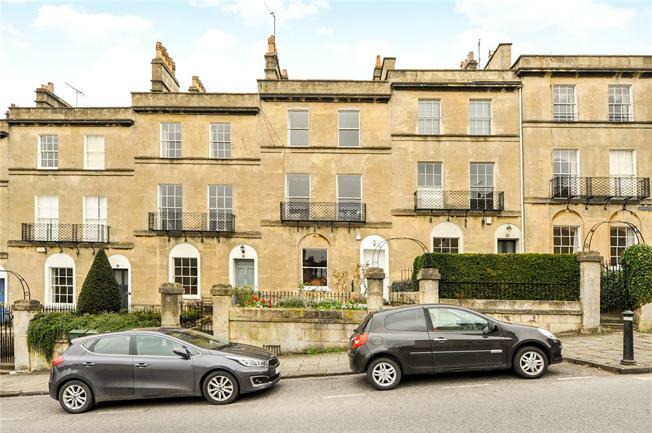 Dunsford Place is an attractive terrace of Grade II Listed townhouses situated on the most sought after lower slopes of Bathwick Hill. This address is so popular as it is a walk down the hill a little onto the level and into the city centre as well as Bath Spa railway station. Also within walking distance are well regarded schools such as King Edwards and Prior Park College. A school bus from the railway station travels up to Kingswood School on the northern slopes. A further benefit of Dunsford Place is it is within the catchment of Bathwick St Mary’s Primary School, one of the most sought after in the city. The University of Bath is situated at the peak of the hill and National Trust land is a short distance away. A low Bath stone wall and wrought iron railings enclose the front terrace. Within the terrace, steps lead down to the lower ground courtyard with access to two front vaults and the flat. The walled garden to the rear can be accessed from the ground floor and basement. In need of general attention the garden offers a blank canvass for redesign.